We spend more on the military than the next eight nations combined. This distorts our economy, entangles us in endless wars, and siphons away resources that should be used to build a more fair and just economy. Military spending should be cut significantly over the next decade, and those funds should be reinvest in our human and physical infrastructure. 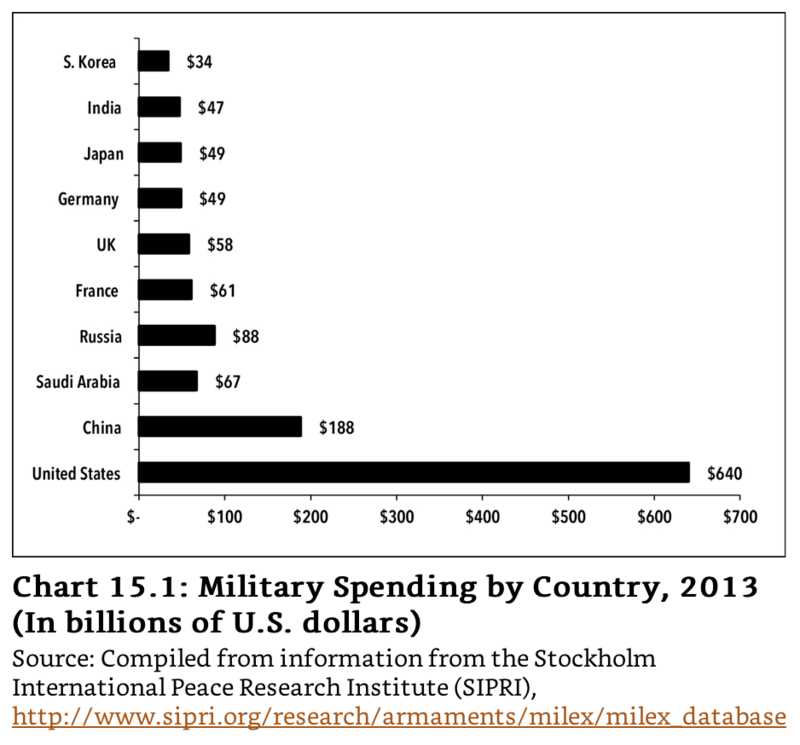 America leads the world in military spending. We spend more each year than the next nine nations combined. 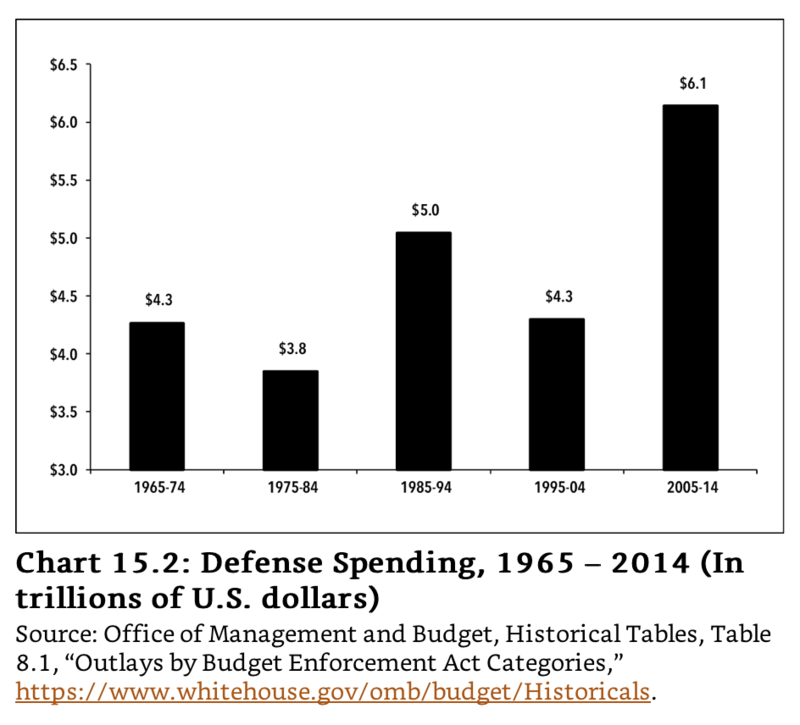 The amount of money we spend on the military has risen steeply since the early 1960s (see Chart 15.2). Even the end of the Cold War in 1989 didn’t stop the military growth spurt. What and who is responsible for this permanent war? The idea probably didn’t originate with the private contractors. It probably came from our national security state – groups inside and outside government including the National Security Agency (which spies on communications), the CIA, the Defense Department, the State Department and the many think tanks and university centers that focus on foreign policy. Although these agencies and their personnel have many disagreements, they did coalesce with very little dissent around the Bush administration’s plan to turn 9/ 11 into the Iraq War. Collectively they wrongly claimed that 1) Iraq had weapons of mass destruction; and 2) Iraq supported Al-Qaeda and therefore was involved in the 9/ 11 attacks. In this, the leaders of the national security state blatantly lied to the American people and led us to wars in the Middle East that have proceeded for well over a decade. Leopold, Les. Runaway Inequality: An Activist’s Guide to Economic Justice (p. 208). 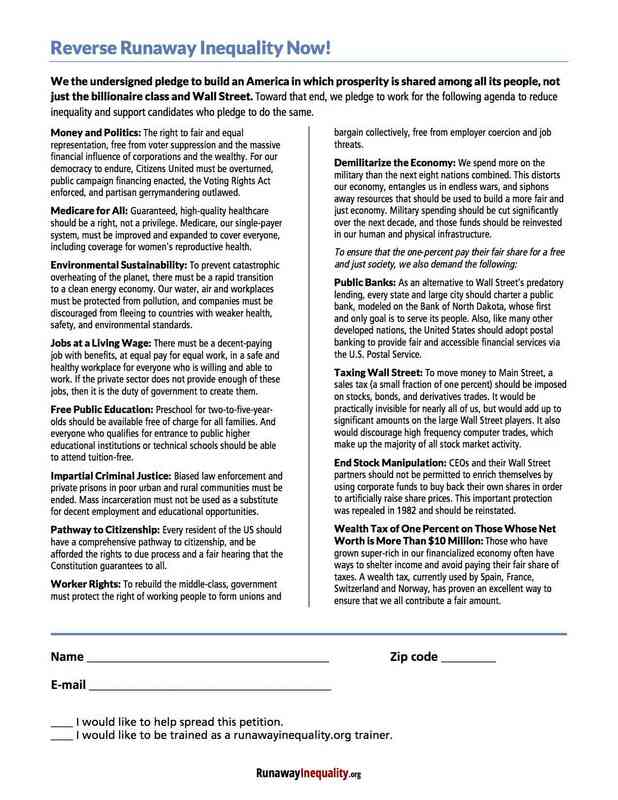 Labor Institute Press. Kindle Edition.